A new exhibit is moving into the Alexander Graham Bell Historic site in Baddeck. A new exhibit is moving into the Alexander Graham Bell Historic site in Baddeck. The replica of the Silver Dart will arrive at the museum this week. The original Silver Dart was designed by Alexander Graham Bell and a group of inventors. It made the first powered flight in Canada back in 1909. The replica repeated the historic flight in 2009, and will now make Baddeck its permanent home. Workers have started carefully unloading the fuselage of the Silver Dart from a trailer behind the museum. The replica has been stored in pieces for a couple of years. "We think of Canada's aerospace industry as things like the Canadarm and the planes the bombardier makes, but I think we were here at the dawn of flight as well," he said. "I'm really excited for Canadians to be able to come and see the Silver Dart and see that legacy." This will also be the legacy for a group of aviation enthusiasts who've spent much of the past decade building the replica. Doug Germyn, president of the Aerial Experiment Association 2005, said his group will bring the plane into the building piece by piece this week then reassemble it. Germyn said putting the Silver Dart in its permanent home gives him mixed feelings. "It's going to be bittersweet, on the one hand it's the end of a long journey and we're glad to be here again, but on the other hand, it's coming to an end. Its been nine years so, we're a little sad to see the end of it. But it's great to be back here." Ebert said the last two weeks have been very exciting for his staff at the national historic site. "Between the wax cylinders at the Smithsonian and being able to hear Bell's voice for the first time and the Silver Dart, I think my staff, we're going to have to sedate them a little bit because they're all so excited. But it's an amazing addition to the museum, I hope lots of Canadians come and see it and that they learn this amazing story." 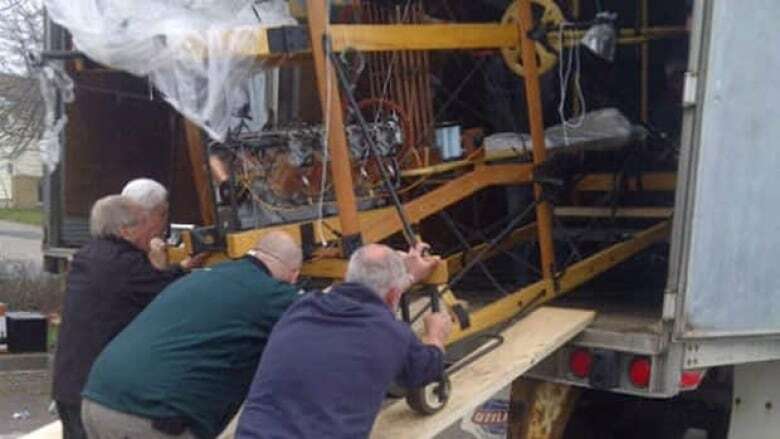 The replica will take several days to reassemble, later this week it will be carefully lifted on a pedestal inside the museum to spend the rest of its days in the air.